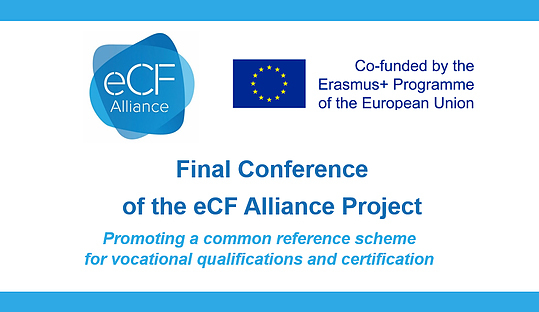 With the objective of promoting a common reference scheme for vocational qualifications and certification the final conference of the eCF Alliance project took place on 11 October in Brussels. During three years, the eCF Council consortium has built the eCF Alliance, a transnational network gathering the major players responsible for IT professionals’ enhancement across Europe, namely employers, professional associations, social partners, VET providers, higher education, research centres, regulatory bodies, and SMEs. This, in response to the critical mismatch between ICT skills demand and offer that Europe is suffering both in terms of trainings and geographical distribution of the required competences against the positions available, and to the need to foster ICT professionalism at the European and international level. The nature of jobs in the broader IT domain is changing and it is no longer enough to be a technical expert. As new technologies develop rapidly, digital skills are becoming increasingly sophisticated and need to be constantly updated. Efforts for maturing IT profession are fundamental to the effective practice of IT. Professionalism must be promoted in the European internal market as well nurturing trust in IT professionals. Continuous development of knowledge, skills and competences is vitally important to reach that goal. The European e-Competence Framework (e-CF) is the result of 10 years continuing effort and commitment by multi-stakeholders from the European ICT sector. The framework was developed, maintained and supported in practical implementation by a large number of European ICT and HR experts in the context of the CEN ICT Skills Workshop. With transformation of the e-CF 3.0 16234:2014 CWA into the European Norm EN 16234:2016, e-CF maintenance responsibility has been taken over by the CEN Technical Committee (TC) 428. The CEN Technical Committee CEN/TC 428 “Digital competences and ICT Professionalism” is responsible for the standardisation of a common language of Professional Digital and ICT competences, skills and knowledge applied in all domains. Speakers also presented case studies of the adoption of the eCF and of ESCO. 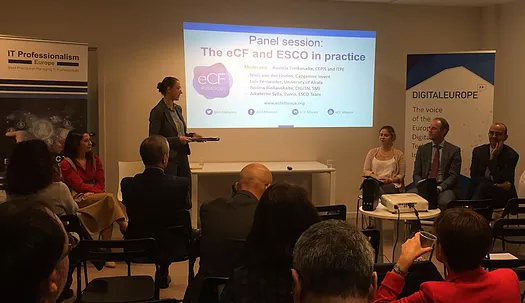 The conference was a unique occasion to present the main outcomes of the eCF Council project, implemented in 2015–18 under the Erasmus+ Programme (Sector Skills Alliances) and gathered the major players responsible for IT professionals’ enhancement across Europe.